The first thing to greet us was the lovely breeze of Karachi which, for a Lahori, was great respite in the monsoon season; at this time in Lahore, the weather is extremely suffocating. 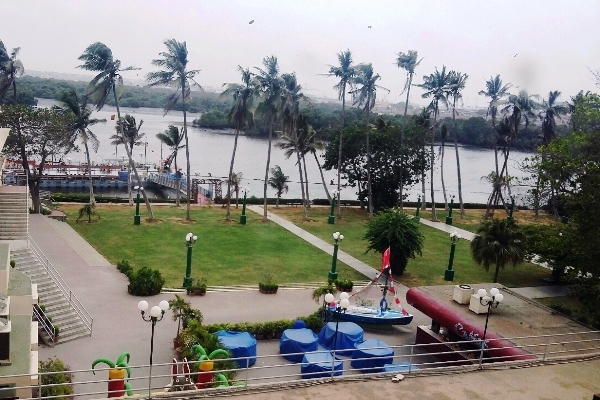 The cool breeze is one thing that I thoroughly enjoyed during my entire stay in Karachi. The lovely view from my hotel room. The trees prove how breezy it was in the city. As is usual, I asked friends and acquaintances to recommend places I could explore, considering I was visiting for the first time. There was one place that everyone insisted upon; a restaurant known as Kolachi at Do Darya; although some of them sarcastically suggested that I also visit Nine Zero and Katti Pahari. Of course, they were not being serious in those suggestions. Beaches are a place that someone living in a land-locked area like Lahore would definitely want to visit. Unfortunately, we didn’t have a lot of time to spare so we could only visit the Clifton beach on a Sunday evening. It turned out to be an extremely awful experience since it was the weekend and it was incredibly crowded, noisy, and surrounded with trash. Surprisingly, there were people around that were selling water in disposable bottles of various sizes for washing one’s feet after enjoying the beach. Even we had to buy it since there was no tap water around. Your visit to a new place remains incomplete if you don’t try its specialty foods. When it comes to experiencing Karachi, biryani is one thing one must not forget to try. So we ended up at a road-side restaurant at Boat Basin and ordered some handi biryani, which is cooked and served in an earthen pot (hence ‘handi’). Thankfully, the taste met expectations; unlike the biryani that’s available in Lahore. Even though Lahore is a foodie’s paradise, biryani (with needs all the right spices and ingredients) is frankly not made properly at its eateries. As suggested, we did make a visit to Kolachi. Unfortunately, we chose the wrong day to go (the same Sunday that we had visited the beach). Since it was the weekend and dinner time, Kolachi was s0 crowded that we would’ve had to wait for at least an hour to get a table. Hence, we dropped the idea and went to another nearby restaurant which was fine too. In any case, Do Darya, the place itself was quite mesmerising and a great place to spend your evening. Another specialty of Karachi that I’ve come across is the sohan halwa which I bought from Rehmat e Shirin at Jinnah International Airport just before leaving to take back for family (upon their request). I specifically mentioned ‘Karachi’s sohan halwa’ here because there is a famous Multani dessert that is also called sohan halwa, and they’re two entirely different things. In Karachi, that Multani dessert is called Habshi Halwa. A friend took me to Dolmen Mall which I was told was the biggest mall of Pakistan, for now anyway, until Lahore’s Emporium Mall becomes fully functional. 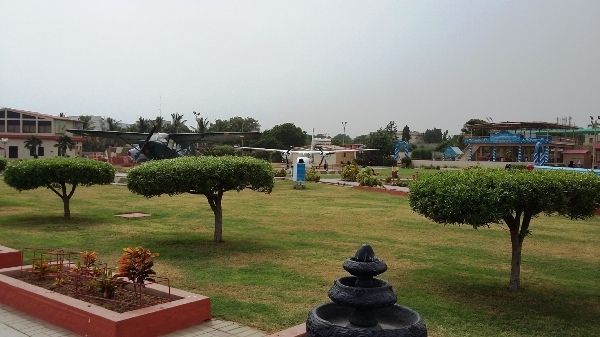 PAF Museum was another great place to visit; it’s not only a rich museum, it’s also a recreational space. PAF Museum was another great place to visit; it’s not only a rich museum, it’s also a recreational space. It was definitely a treat to learn things about the Pakistan Air force and the great men who have served our country till date. It was definitely a treat to learn things about the Pakistan Air force. And the great men who have served our country till date. There are obvious differences between Karachi and Lahore. The former has a more ethnically diverse population made apparent while visiting public places. This is probably because a port city offers a vast number of opportunities to earn a living and thus attracts people from across the country. After the short visit to the city, my fellow companions felt that Karachi is more liberal than Lahore, especially when it comes to female dressing. When it comes to Karachi’s airport, it is far better than Lahore’s. Thankfully, the impression one has once they’ve stepped out of the Lahore airport changes the initial disappointment (the greenery and cleanliness wins everyone over). There is a considerable variety of small eateries at Karachi’s Jinnah International Airport, something lacking at Lahore’s Allama Iqbal International Airport. Karachi has big buildings but most of them look very old and ill-maintained. Same goes for the bridges, which aren’t just old; they’re filthy as they’re laden with garbage. Trash on bridges is a sight I have never come across in Lahore. Trash on bridges is a sight I have never come across in Lahore. 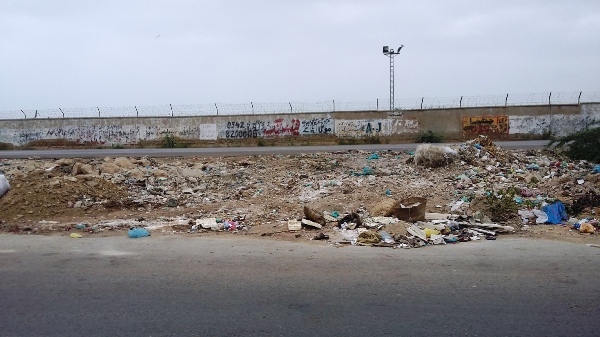 But it’s not just bridges; holistically speaking, Karachi is a filthy city because garbage is dumped almost everywhere. 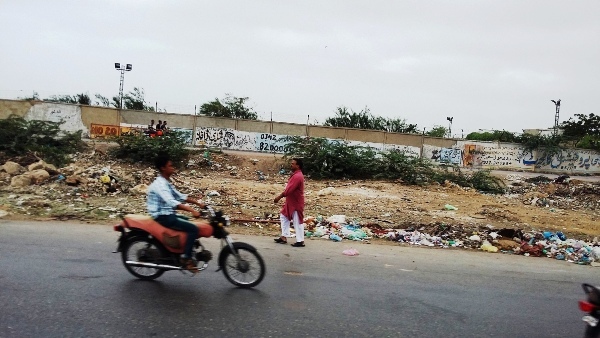 Karachi is a filthy city because garbage is dumped almost everywhere. Besides this, there is excessive air pollution as well which adds to the terribly unhealthy environment. Another thing I noticed in Karachi was that everything is ‘so far away’. Being a large city, it is a very common phrase heard in Karachi. Getting late seems to be a common problem owing to the ‘distance and traffic’, since it is a big city that is home to a huge population. Since Karachi is the economic hub of the country, it deserves its fair share of development and maintenance. Unfortunately the political parties that have been ruling it for years only seem concerned about controlling the city rather than working towards making it better. Comparatively, Punjab has developed its main city quite well and one can clearly feel the difference in a single visit. 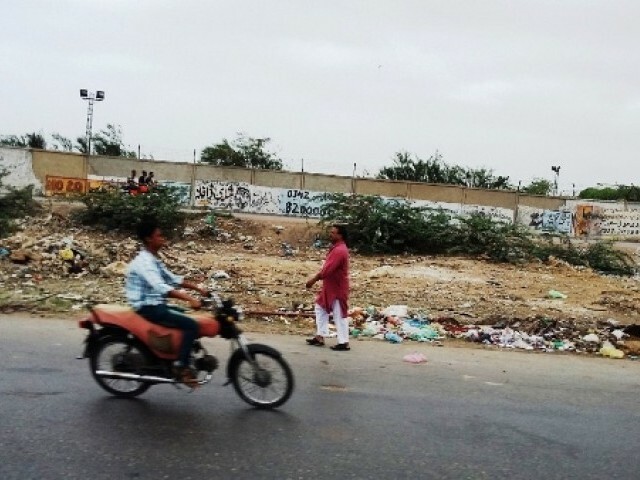 Introduction of campaigns like ‘Clean it’ and ‘Fix it’ makes us hopeful of growing awareness among Karachiites to fix the city within their own capacities. Moreover, with the new Chief Minister in place, lets hope that one of the most important cities of Pakistan will start looking a lot better in the times to come. May Karachi achieve the peace and prosperity that it rightly deserves! wade through it on a daily basis….to get anywhere. to win the rigged elections again and again and again…..
of trash and deposit it at a location,…but it STAYS there!!! there is no money, for the local government, to do so. Why? The remaining left over money… stays in the Ditch….you follow? Now, then,…do you understand this simple conundrum? Nope. 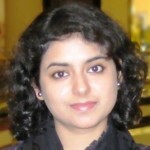 Interesting blog but there are many things that need to be considered before making opinion about Karachi. First things first whenever you travel in Cab esp from Airport you need to guess ethnicity of the driver. Non Karachite he will praise LeAs as if they have turned the city into heaven. If you request the same driver to stay aside and talk on your mobile phone on the main road for 5 minutes he would never do this dare. So law and order is not improved and street crime is all time high here. All port cities do booming business because of their contact with the sea. Even if branches are located in entire Pakistan the headquarter is in Karachi. MQM has been in power in karachi for as long as i can remember. For a highly educated party it does not know how to pick up trash. Has MQM ever brought this matter in assembly. Instead Bhai has proudly played the muhajir card many many times. So instead of playing the muhajir card if he could have played the budget card he would have been more believed. If garbage is not picked in Punjab Shahbaz Sharif loses votes . This comment was edited by hindu paid moderators. Exactly!! They should have Provincial Border Control. speculators and other riff raff that floats in to Karachi. No one from any province, SPECIALLY from Punjab. Punjab is the home of every banned extremist outfit. burden on EVERY facility. Overtaxed it. And they keep coming. age children have never seen the inside of a school.